Planet Waves Custom Series cables utilize ultra-pure, oxygen-free copper conductors for low capacitance and pure tone. Encapsulated and impenetrable soldering points with double-molded strain relief provide maximum durability and worry-free reliability. Two layers of shielding provide 100% coverage for superior insulation and noise rejection, making this the ultimate, high-performance cable. 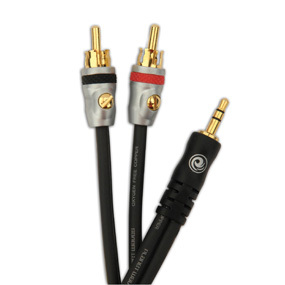 - Dual RCA to stereo mini - In=Out Technology: Low capacitance for pure signal transparency - Two layers of shielding provide noise rejection for quiet operation - Ideal for connecting portable audio devices to a home theater system - Limited lifetime guarantee Planet Waves cables are the ultimate musician's cable. Utilizing exclusive In=Out Technology for pure signal reproduction, Planet Waves cables are built tough to withstand gigs and come with a limited lifetime guarantee. Planet Waves is a part of the D'Addario and Co. family of brands, the global leader in musical accessories.